Aplia Econ Blog: News for Economics Students: And You Think Low Prices Are Always Best? With persistent hyperinflation, money has become worthless in Zimbabwe. The official inflation rate in May was 4,500%, but according to estimates, the real rate had already reached 9,000%. In response to the continuously rising prices, President Mugabe of Zimbabwe ordered the prices of all commodities be cut by at least half. This type of price control by the government is referred to as a price ceiling, with the selling price set below the equilibrium price. Let's examine the effect of a price ceiling using the supply and demand diagram to the right. Let Pe and Qe be the equilibrium price and quantity of a commodity. 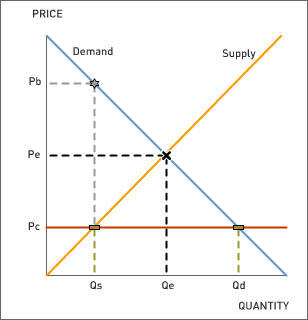 A price ceiling that regulates the commodity to be sold at Pc leads to an increase in quantity demanded to Qd. At the same time, producers reduce the supply of the commodity at Pc, thereby lowering the quantity supplied to Qs. Hence, there will be excess demand, or shortage (Qd – Qs) for the commodity. This is exactly what the Zimbabweans are experiencing in the wake of Mugabe’s price cuts. Many commodities were swept from the shelves and disappeared from sale as producers refused to supply more at the regulated price. The story does not end here, though. From the supply and demand model, we see that at Qs, some people are willing to pay as much as Pb to obtain the commodity. Therefore, informal markets emerge with people buying and selling commodities at prices much higher than the regulated or market equilibrium prices. Read Chris McGreal’s article in The Guardian to learn more. 1. According to the article, what might be the reasons behind President Mugabe’s price cuts? 2. Who stands to benefit from the price controls in Zimbabwe? Who stands to lose? 3. What could the Zimbabwean government do to save the economy?